Are you experiencing stopped-up drains, noises from toilets when your washing machine runs, or gurgling drains? 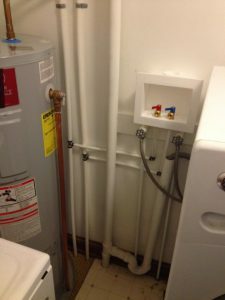 You probably have some kind of stoppage or clog in your waste plumbing lines. These lines help transport waste water from your house to your septic system or public utility sewer mains. Clogs can occur either in secondary lines throughout your home, or in the main sewer line leading outside. If you’re just having an issue in one part of your house, that could be a sign that you have a localized clog in one of your secondary drain lines. If you’re experiencing problems throughout your home, it’s probably something more serious in your main line. Tree roots often grow into underground sewer lines. Hair can accumulate in a drain line. Items that should be discarded in the trash are instead flushed down the toilet (paper towels, personal care products, etc.). Supply lines can leak too! Here we replaced leaking copper with pex. Sewer line clogs can create a dangerous situation. If raw sewage backs up into your home, you could suffer costly, messy damage. Harmful sewer gases can also escape into the home. Solutions to a clogged sewer range from the simple to the very complicated. It all depends on the nature and extent of the clog. Simple clogs might be able to be remedied by the homeowner with a plunger or small hand auger. More serious clogs may require use of an electric drain auger, which can clear tree roots and other major stoppages. Most clogs can be cleared this way. Occasionally, if the powered auger is not able to clear the blockage, the use of a drain camera may be required. In the most serious cases (i.e., major tree root issues, crushed main drain line) a replacement drain line may need to be run. James River Air’s plumbers can help evaluate your sewer line issue and recommend the most cost-effective way to remedy the problem. While most clogs can be cleared up pretty easily, if you do have a more severe clog, James River Air has the tools and the knowledge to find and clear it.